Phonographic Copyright (p) – BMG Music Canada Inc. Copyright (c) – BMG Music Canada Inc. Distributed By – BMG Music Canada Inc. Published By – Stiff Shirt Music, Inc. Published By – Sugar Biscuit Music Inc. Published By – Foreign Imported Productions & Publishing, Inc.
Track 1 [published by] 1996 Groove 78 Music (adm.) Almo Music Corp. (ASCAP) / ECAF Music / Sony Songs, Inc. (BMI). From the forthcoming "Secrets", 73008-26020-2/4. Track 2 [published by] Outna Oundsa Music / Stiff Shirt Music, Inc. (BMI). From the "Words" releases, 73008-26002-2/4. Track 3 [published by Schizo Music (ASCAP). From the "I Am [...]" releases, 07863-66582-2-/4. Track 4 [published by] Edward Grant / Running Arends Music (adm. by Reunion Music Publishing) (ASCAP). From the "I Can Hear You" releases, 08068-83737-2/4. Track 5 [published by] Zomba Songs Inc. / R. Kelly Publishing Inc. (adm. by Zomba Songs Inc.) (BMI). from the "R. Kelly" releases, 01241-41579-2/4. Track 6 [published by] Champion Music / BMG Songs (ASCAP). From the forthcoming "Land Of The Living" releases, 07863-66842-2/4. Track 7 [published by] Gibb Brothers Music / BMG Music Publishing Ltd. From the "Greatest Hits" releases, 07822-18932-2/4. Track 8 [published by] Dr. Songs. From the "Born In Africa" releases, 74321-36131-2/4. Track 9 [published by] Al's Street Music / Almo Music Corp. / Sailandra Publishing / One Ole Ghetto Ho / WB Music Corp. / Wonder Woman Sings Publishing (ASCAP) / Sugar Biscuit Music, Inc. / Kenix Music (ASCAP) / Warner Chappell Music Ltd. (PRS). From the "New Beginning" releases, 07863-66487-2/4. Track 10 [published by] Bahama Rhythm Music / Warner Chappell. From the "Club Cutz Volume 7" releases. 74321-33410-2/4. Track 11 [published by] Foreign Imported Production And Publishing, Inc. (BMI) / Realsongs (ASCAP). From the "Rhythm Of The Games" releases, 73008-26026-2/4. Track 12 [published by] ECAF Music / Song Songs, Inc. (BMI). From the "Waiting To Exhale" releases, 07822-18796-2/4. This compilation ℗+© 1996 BMG Music Canada Inc. Distributed by BMG Music Canada Inc. / Distribué par Musique BMG du Canada Inc. Printed in Canada [inlay]. 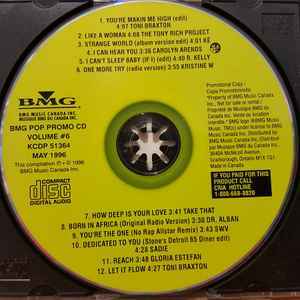 This compilation ℗+© 1996 BMG Music Canada Inc. Distributed by BMG Music Canada Inc. / Distribué par Musique BMG du Canada Inc. Made in Canada [disc]. The release is housed in a regular sized jewel case with a back inlay, no front cover was issued.